Judging from his public speeches, Franklin D. Roosevelt–aka FDR–may have been our most religious 20th century President. In his inaugural addresses, fire-side chats, and other speeches, FDR spoke directly to the American people using a language both he and they knew well. As Erin Blakemore wrote recently here, the language of the King James Version was imbued in the culture. The 30 fireside chats over the eleven years of the Roosevelt presidency were unlike anything that had ever happened before. The first, addressing the banking crisis, took place eight days after his inauguration in March, 1933. These chats were intimate affairs, the result of radio’s remarkable ability to speak directly to listeners (movies and, later, television, might be said to be more lecture-like). And listeners talked back via letters and telegrams, flooding the White House with approval, not for the famous phrases, but for the religious allusions, stories, and references. Isetti sees New Deal reformism as “highly moralistic, prophetic, and even biblical in both its inspiration and tone.” While FDR’s enemies considered him betraying his patrician background, he never actually challenged the system itself. 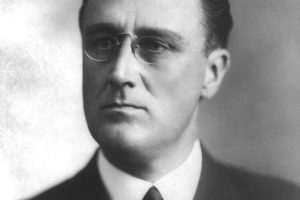 Rather, his focus lay on the bad apples, or “the moneychangers in the temple.” Indeed, FDR pulled capitalism’s chestnuts from the fire of its own making, preempting potential radicalization of the millions of people who were unemployed and forestalling the potential rise of fascism—the two European responses to the terrible crisis of the 1930s. Isetti says that FDR skillfully used a shared language to craft a “civil region” for Americans in hard times. In inspiring a frightened nation, Isetti argues, what FDR said may have been just as important as his actions. Not everyone was on board, of course; the critic Edmund Wilson called the first inaugural speech “the old unctuousness, the old pulpit vagueness.” It might have been enough, though, to give people hope. At least until the massive deficit spending of World War II yanked the nation out of the ruins of the Great Depression and set the stage for the post-war boom. Originally published by JSTOR Daily, reprinted with permission for educational, non-commercial purposes.